April Observations - Printers as things? Do printers fit as part of the Internet-of-things? HP's Instant Ink program looks like a case study of "The Internet of Things"
Some recent visions of our industry have seen printers, scanners, and MFPs as powerful central hubs in a cloud-based future. But what of a somewhat more humble but potentially more pervasive role? Lately, I have been asking, even advocating, a position more along the lines of "printers as things", specifically as in part of the "Internet of things" (IOT). A consultation with Wikipedia, the ultimate source, or at least the ultimate starting point, especially for all things technoid in nature, led me to its "Internet of things" article. The entry starts off with description of "IOT" as referring "to uniquely identifiable objects and their virtual representations in an Internet-like structure". While that's a little general, later in the article, in a brief discussion, it really starts to sound like something that can and does apply to printers. The article touches on "predictive interaction", describing "where cloud or fog based decision makers will predict the user's next action and trigger some reaction." I think one only has to look as far as HP's Instant Ink program offering to see the connection. I have been intrigued with the development of HP's Instant Ink for some time now, partly because it seemed to represent the manifestation of a vision going back twenty years, at a time during the middle of my 25-year HP career. A team I led in 1994 had the great opportunity to be among the first to think about the then-nascent Internet and what impact it would have on printers and printing. We foresaw things changing on a grander scale, like the societal shift in information dissemination, from centralized printing followed by distribution ("print and distribute") to electronic distribution with optional printing at the point of consumption ("distribute and print"). But we also predicted (fancied might be the better word) that there would come a time when a printer (LaserJet in our case) could detect an impending need for additional toner and "order" its own replacement cartridge in a timely manner. It took twenty years for this vision to be realized via Instant Ink, where consumers' printing habits are tracked and their ink needs fulfilled via timely replacement ink shipments via the mail. And while the program deserves a full "Observations" to do its many "moving parts" justice (stay tuned), its role as an example of printers as "things", as in the "Internet of things", should be clear. For an outside view, I sought out an expert recently, who might give some further perspective on this premise. Steve Hoffenberg is currently Director, Machine-to-Machine Embedded Software & Tools at VDC Research in the Boston area. Before that, he and I were colleagues at Lyra Research for a bit, and before that, while I was still with HP, I knew him as Lyra's expert on digital imaging, who reported on the advent and eventual explosion of digital photography, and analyzed its huge (and varying) impact on printing. In emails and phone conversations, Steve and I explored this "printers as things" idea, and he surprised me by even taking it a step further, suggesting Managed Print Services (MPS) as an early proof point for further IOT development. Just as its "supplies management" component has been used as a comparison point for some who have referred to Instant Ink as "MPS for the home", its other interactions via the network can be seen as ground-breaking in terms of network-based management and control. In Steve's words, "Managed Print Services were early implementations of the 'Internet of Things,' without the parties involved referring to it by that phrase. The printer industry was one of the leaders in a technology revolution of connected devices, but it was flying under the radar of the Internet cognoscenti." That's pretty good validation for my "things" thinking - even if some in the printing and imaging world see it as a demotion of sorts! Glass - Will You Still Love Me Tomorrow? I have been a Glass Explorer over a year now, going by the fact I was notified I was "in" near the end of March 2013. I didn't pick up my unit until mid-August, and have been through a number of interesting Glass-related experiences since then, most involving, at least in part, the "exclusive" nature of being in the program. So along with the recent news and media discussion about Glass backlash and Google's approach to the B2B market, I have also been intrigued with the "get your Glass" one-day sale slated for tomorrow, April 15th. 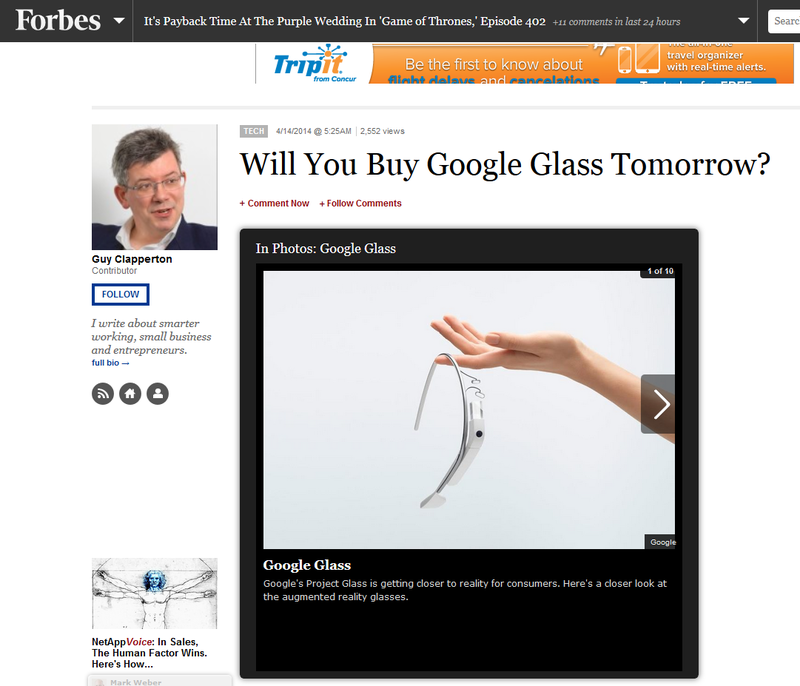 And when I saw the Forbes piece this morning by @GuyClapperton, "Will You Buy Google Glass Tomorrow" I enjoyed reading the pros and cons for would-be purchasers. And I also had the classic song, "Will You Still Love Me Tomorrow? ", originally recorded by the Shirelles and co-authored by Idaho's own Carole King, came to mind. Though I think it's Google and Glass asking me the question. As mentioned, the door-opening characteristic of my Explorer status is based on its novelty and as Glass gets more and more common, that certainly diminishes. I remember in 2008 when it felt like owning and using an Apple iPhone gave one a bit of an exclusive feeling, in a somewhat similar way, like part of a small club. NOTE - This is a revised version of the (draft) post which appeared earlier this morning. 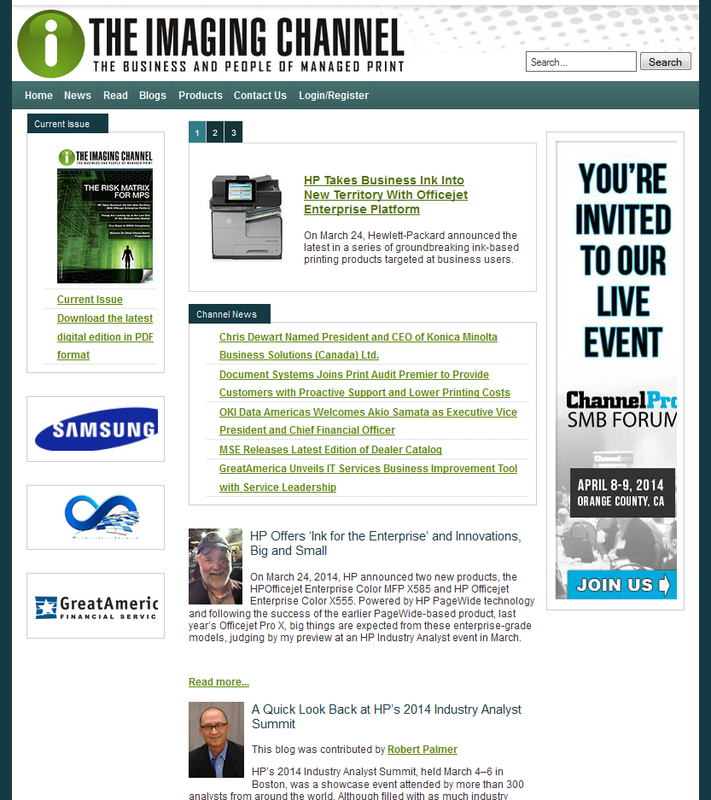 Back on The Imaging Channel! I am delighted to report the Jim Lyons Observations is BACK on The Imaging Channel. My March Observations, "HP Offers ‘Ink for the Enterprise’ and Innovations, Big and Small" are now posted and I look forward to future columns appearing there the same time they are posted here. I will also note, with delight, the juxtaposition of my Observations with another take on HP's new "Ink for the Enterprise" Officejet MFP and printer by my good friend and highly respected industry analyst Robert Palmer. (See screen shot, above.) His drill-down on the two products is linked from the top story, and then his recap of the HP Industry Analysts event (which we both attended) is referenced below the link to Observations.